But they shouldn’t forget where they came from. Horgan and his party owe their governing agreement with the Green Party to progressive and environmental voters who put them in power — and decided in Nanaimo to keep them there. But those people can’t be taken for granted any longer. British Columbians are watching the government to see if they mean what they say about reconciliation with First Nations and human rights. And after approving the Site C dam in late 2017 and the RCMP raid on Wet’suwet’en territory a few weeks ago, it’s looking like they are at risk of falling short. 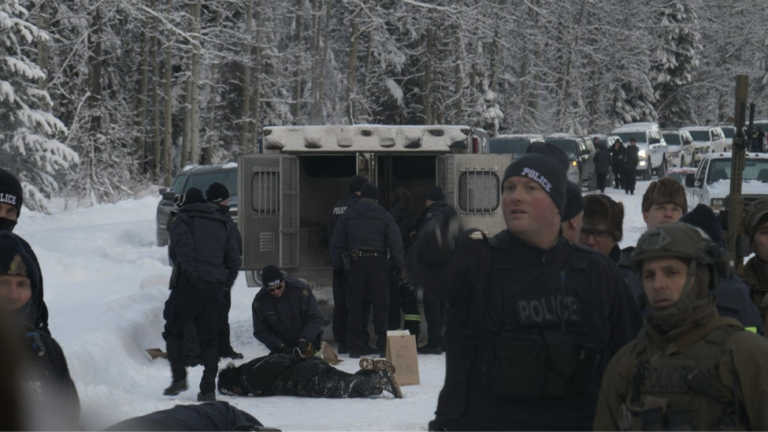 Let’s be clear: police in olive green fatigues, carrying automatic rifles, threw unarmed Indigenous people facedown in the snow on their own territory. This is not a bad public relations incident that can be easily erased from our collective consciousness. It was a violation of human rights. It directly went against the principles of UNDRIP. It was witnessed by the whole world. This isn’t something that Horgan can just wipe away — and it isn’t something he should. Reconciliation is about taking ownership of injustice and working with Indigenous people and nations to find a way forward. That can’t be done at gunpoint. Speaking of reconciliation, let’s talk about the Trans Mountain pipeline and tanker expansion project. Premier Horgan promised to use “every tool in the toolbox” to stand up for British Columbians’ health and safety, our coast and our climate. Yet his government continues to defend Christy Clark’s approval of the pipeline in court. Christy Clark approved the pipeline project after receiving $771,168 in political donations from Kinder Morgan and its oil industry buddies. Instead of putting the project through a proper, made-in-B.C. review, she relied on the fatally flawed NEB process — which has since been quashed by the Federal Court of Appeal. Since the federal approval has been rendered invalid, logic follows that the provincial one should be as well. But, rather than reassessing that approval, Horgan’s government has chosen to uphold Christy Clark’s approval — and is actively fighting the Squamish Nation in court over it. B.C. is also a huge exporter of U.S. thermal coal. As someone who “digs coal,” this is great news for President Donald Trump — because ports in Oregon and Washington State don’t want the stuff. Six proposals for coal ports in those states have been scrapped because of the effect of coal dust on the environment and human health. Yet those trains chug right through White Rock, Surrey and Delta every day. And the number of coal trains coming through our province is increasing. American coal companies are taking advantage of B.C.’s lax health and environmental regulations. Plus they don’t have to pay the same carbon tax applied to metallurgical coal operations in B.C. That’s right, these American coal trains get a free ride through B.C. The government can’t impose a carbon tax on coal that’s mined outside the province, but they do have the power to apply an equivalent levy. It’s time to do so — because while coal companies don’t pay their fair share, there is a health and safety cost for the people who live along the shipment route, not to mention devastating global climate impacts. Under Christy Clark’s government, mining and fracking companies received tax credits for exploratory work in B.C., renewed on a year-by-year basis. This week Horgan announced that he is going to not only carry on Clark’s legacy of subsidizing resource corporations, he is doubling down by making the tax giveaway permanent. During a speech to a room full of mining execs, Horgan said that left-leaning governments are often thought of as anti-resource development. But his NDP government was different. They want to incentivize resource extraction in B.C., Horgan promised. Just look at the new LNG Canada project his government is propping up with public money. Which, of course, is what triggered the RCMP raid on Wet’suwet’en territory, along the route of the pipeline that would feed the proposed gas plant. Two years into their minority mandate, the BC NDP is at an important crossroads. And the more choices they make that mirror the previous government, the less likely it is that their supporters will stick around come the next election. There is one glaring difference between the current government and the past one and it’s becoming more obvious with each news headline. Casinos laundering billions for organized crime. Drug dealers pumping dirty cash into the inflated housing market. Two friends of the former premier appointed into high positions in legislature caught abusing their expense accounts. There appears to be a widespread culture of greed and corruption that took root and flourished under the previous BC Liberal government. Now British Columbians want answers. This isn’t to say that mud won’t splatter on the BC NDP. Both parties have a long history in the legislature and there is probably dirt on both sides of the aisle. But after 16 years of secretive, unaccountable government ruled by a party that raised an unprecedented amount of money from industry CEOs and lobbyists, most of the public’s anger is likely to land on the BC Liberals. So, will Horgan’s NDP choose to root out the rot and restore public faith in our institutions – even if some of their friends and past donors end up caught in the dragnet? During the by-election in Nanaimo, Dogwood volunteers ran an informal survey of Nanaimo voters. We picked up a lot of anger and anxiety. People are feeling ground down by the high cost of living. They’re disgusted by the waste, greed and entitlement of the political class. And they’re scared by the accelerating climate crisis. Everyone is looking for someone to blame. On each of these issues, the NDP can be part of the problem or part of the solution. If Horgan doesn’t take this opportunity to clean house and set us on track for a sustainable future, voters may not be as generous next time as they were in Nanaimo. Politics is changing. Voters are becoming more interested in issues, and less interested in politicians themselves. Look at the youth-led Sunrise Movement or the fight for universal healthcare in the U.S. Here in Canada, we’ve heard enough rhetoric and empty promises — we want bold action that actually makes a difference on reconciliation and climate change — and strengthens our democracy. Anything less and this government could see its agreement with the Green Party — and its coalition of progressive voters — start to fragment. So, I am one of the voters that voted NDP in the Nanaimo riding to keep the liberals at bay. How ever this does not mean I agree at all with fracking, and I still want every tool in the box used to stop the TMX pipe line. The NDP are now officially on probation as far as I am concerned. I don’t how the Greens let Horgan get away with these lies and this assault on the Wet’suwet’en people is criminal. Christy Clarke is on a power trip. Build refineries and keep this filthy oil in your own province. B.C. Liberal candidate Tony Harris received 8,272 votes, which has to make me wonder why even one voter would support any liberal party candidate after the mess that party left the province in. As far as Premier Horgan goes, the more bad Liberal Party policies from the past that he adopts, the less future support he will receive from those that are really angry about the current, ongoing crisis situations in BC. Who is more dangerous to BC’s future? The politicos or party faithful voters? I am had great hopes for the NDP, but Horgans government is not what I wanted. They are loosing me. I hope Horgan heeds your warning–I am one of many moving towards the Greens. If andrew Weaver drops his insistence that EMF/RF is as harmless as Health Canada claims, I will jump. Spot on , and am so glad your working at Dogwood. You’ll notice the NDP have put down the idea of a Independent Audit of the BC Legislature , and will rely on the Governments Auditor General who failed in her role a proper oversight of expenses. As in 8 months on the job CraigJames was paid out $257,000 for a pension. Then the paperwork on this vanished only to be presented to the RCMP inquiry by someone who saved a copy of the transaction thinking it might be useful years later. Yet Linda Reid who was Auditor General under the Liberals at that time is still on job! If the NDP think they are impressing the Business Community by this in house audit they are severely delusional about the transparancy business needs. Campaign for an Independent Audit! By someone like the Auditor, the Australian who was fired by raising questions about irregularities , then having a hard time even being paid for services rendered. Lets go until we catch up with BCRail miscarraige of justice. The fragmentation already happened. I’m in touch with many environmentalists and social justice people and vast majority of them can’t even stand John Horgan and many of his ministers. They all speak of betrayal and I echo their feelings. In fact I wished that a green candidate would have won in Nanaimo – or any other in fact. BC NDP just does not get it – and Horgan’s latest lament about erasing the image of what is going on in the north with the Wet’suwet’en – that was stupid and arrogant. I am so done with this BC NDP government. You listed the issues; they’re no small potatoes. BC NDP completely betrayed the very people that put them in power. I am disgusted and I would urge any BC NDP MLA that still has a shred of moral fiber, to risk their political career and cross the floor and become independent. And then hold the BC NDP party by their b***s and told them they have to clean up or else bye bye government. Enough is enough! Horgan isn’t going to “clean house.” He’s going to continue betraying the progressive voters who supported him in the last election. It’s obvious that Horgan is owned by unions and business, and it’s pointless to imagine that he will suddenly start respecting the environment and the human rights of Indigenous people. The NDP are liars, racists, and a lost cause. And what’s going on with “Green” Andrew Weaver? Doesn’t he object to anything? Can you give us a clean copy of Lisa’s article so we can send it around? Try to copy it; it’s a mess. Great article – so true! Time to step up Premier Horgan! And there are only 2 parties in BC.? The Greens are the solution. The government is NOT a coalition. If you want progressive change, vote Green. How about talking about them for once? Andrew, Adam, and Sonia are three dedicated MLAs working hard for their CONSTITUENTS and the environment. Amen…agree with these comments. We need to make our voices heard in BC parliament and make sure the MLA in our own areas is aware that respect for First Nations and the environment and a more equitable sharing of wealth among citizens needs to be a priority for the NDP. I think the Green party , of which I am a member , should consider withdrawing their NDP support if they do not support the fracking of the north of BC. Having just returned from Hudson Hope area I couldn’t believe the extent of the Natural gas industry. We have to realize that billions upon billions of gallons of water and unknown (to us) chemicals are being pumped into our aquifers, forever polluting them. If that huge plant is built in Kitimat the foreign owners will want guarantees for decades that they will have access to natural gas. I appreciate that the industry will employ many people but so would developing alternative renewable energy. B.C.’s northland will be a disaster when these foreign industries pull up and leave. I agree….restoring senior ferry rides Mon-Thurs….plus eliminating health costs was a tidbit….but total stooges on 1st nations integrity….site C…KM….needs to get that dirty moola outa the toilet bowl….and kick out all fish farms….get our orcas back on track….too little too late….purely just another flavour of a Lib/conartist….need to go green …..no other real choices….??. Thank you, Lisa, for these thoughts. Also Peter has the right idea about individual members resigning the “party” and becoming independent members with a lot of clout! I too, am dismayed by the unacceptable stance of Horgan, he, of all people, should know better! The advises of you, Lisa, and the the collective thoughts of the commenters are to be taken with the seriousness they deserve. Well done! Given Malcolmson’s massive win in Nanaimo, it’s just plain naive to think the NDP will do anything different than what they’ve been doing to date. And as long as ordinary citizens continue to allow themselves to be blackmailed by the specter of vote-splitting no election will have an impact on them either. Real change can only happen with real change in our daily personal livesand choices. Obviously going greener is the solution. Simple to say, much more diffoand complex to achieve. But certainly possible. We have the science and technology to preserve, protect and develop a healthy sustainable future, and share our wealth rather than hoard it. The ballot box is a one shot deal that many younger people no longer believe can change. After the last federal election I have to agree. It’s grossly outdated and clearly subject to corporate design for express lane profits. I’m not the only one seeing more similarities than differences between the NDP and Liberals. Please do not vote against anything. Vote for what you believe in. And get involved with your community. Peace and health people. Actually, he has opposed many of the NDPs policies and has gained a number of concessions. Those don’t get the coverage they deserve. The Supply & Confidence Agreement is a tricky thing. If the NDP make an issue – as they did with the speculation tax – a Confidence issue if the Green’s don’t go along with it, a province wide election is triggered. This is not something to take lightly. British Columbians must do what progressives in AB have failed to do: hold the NDP Govt to account for fear of a worse alternative. Get enough voters to sign a petition. Then march to the legislature to deliver it. It’s the only hope. If we let pseudo-progressive politicians take us for granted, that’s exactly what they’ll do. No more! Stand up and be counted. If not us, who? Peter, what’s wrong with becoming a green to set an example and put the screws to Horgan & Co. on votes. Ken, are your aware that the leader of the BC Greens is on record supporting a new tar pipe, refinery, and tankers at Kitimat? And get this: the project is called “Kitimat Clean.” Orwell would be proud of a Green Party in love with a “Clean” refinery, tar pipe, and orca-killing tankers.